Cass Sunstein, JD, Harvard Law School Professor and co-author of the book "Nudge," keynoted the event (above, left). "Penn," he noted, "is now really the center nationally, and probably internationally, for using behavioral science in health care and medicine in a way that is leading so many of us in how to produce better outcomes for patients." Sunstein revealed that the book manuscript he and University of Chicago Professor Richard Thaler originally wrote was entitled "Libertarian Paternalism" until one of the publishers who declined to bid on it strongly suggested they change the name to "Nudge." The term "libertarian paternalism," describes interventions designed to influence a person's decision making while not restricting that individual's freedom of choice. The book, now a touchstone in its rapidly-rising area of behavioral science, has sold nearly a million copies since it was published in 2008. In his own remarks opening the Nudge Units in Health Care Symposium (above, right) Kevin Volpp said "probably more than any other single piece of work, the publication of Nudge has done more to transform how the general public thinks about behavioral economics and how people make decisions and the potential for that to be a positive force for social good." 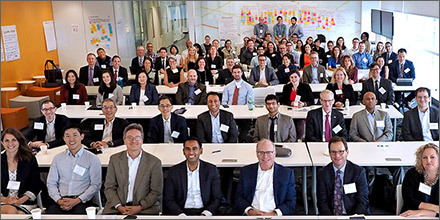 Penn Nudge Unit Director Mitesh Patel (above, left) explained that, as a Penn Robert Wood Johnson Clinical Scholar in 2012, he became interested in the increasingly discussed "nudge" area of behavioral science and set out to identify potential nudges inside the hospital clinical environment. Simultaneously, the University of Pennsylvania Health System began a five-year $330 million project to digitally unify its $8 billion-a-year sprawl of hospitals, clinics and affiliated practices onto a single EPIC-based electronic health records system. That effort enabled the central IT Department to make changes in the EHR system that would immediately go live across all clinical operations. For Patel, that suggested new ways of thinking about testing, confirming and conveniently implementing EHR-related nudges designed to influence clinicians' decision-making. One of the first nudge experiments was so unexpectedly successful, it directly led to the 2016 creation of the Penn Medicine Nudge Unit, the first such behavioral research entity established inside a major health system. Penn Medicine clinicians had long had the dubious distinction of having the lowest level of generic drug prescribing among regional hospital systems. In a small pilot project, Patel showed how the Penn EHR system was configured to default to brand-name drugs rather than their generic equivalents. In late 2014 he published a paper detailing his story of how "nudging," or switching the EHR system's default to favor generic drugs, immediately resulted in one department's significant increase in generic prescribing. When the same change was later made live across the entire Penn Medicine clinical network in 2015, the health system suddenly became the number one prescriber of generic drugs among the region's hospitals. A recent analysis estimated that in the two and a half years following the intervention, savings generated by the default shift for the top 75 drugs came to $32 million. Penn's Center for Health Care Innovation's Executive Director David Asch (above, right) told the symposium audience "what excites me (about the Nudge Unit's work so far) is the blending of the kind of scholarship and insight we typically see in an academic environment with the operational implementation we typically see throughout hospitals and health systems. This kind of rigor and relevance is what is combined in our own Nudge Unit and offers such a fertile common ground of interest and exploration for everyone in this room." "A Nudge Unit provides ways to be more effective in terms of our communications and the outcomes we're looking for," University of Pennsylvania Health System (UPHS) Chief Administration Officer Kevin Mahoney, MBA (above, left), told the crowd. Mahoney is also Vice Dean of Penn's Perelman School of Medicine and an LDI Senior Fellow. "Nudge strategies are already paying dividends for us in reducing our costs and improving patient outcomes," he said. UPHS Associate Vice President of Information Services Applications Christine VanZandbergen (above, right), MPH, MS, PA-C, emphasized that, while five years of consolidating and enhancing Penn Medicine's central clinical computer system did provide a powerful platform for Nudge Unit operations, it also required significant shifts in the culture. A survey of the attending health system representatives found that 100% of them were seeking guidance about how to create a nudge unit, 60% were interested in ongoing hands-on assistance in that effort, and 50% hoped to share Penn's pragmatic insights about how best to approach such a project. The panel "Structure and early lessons from the Penn Medicine Nudge Unit" (above, left) was one of several sessions devoted to the topic. Mahoney, VanZandbergen and Patel (above, right) detailed the organization, staffing, financing, logistical and cultural requirements for integrating a behavioral research unit into clinical operations. They also announced the launch of a Nudge Unit Collaborative website designed to support the growth of a national information-sharing community of health system administrators, clinicians and researchers involved in nudge initiatives. Networking was the order of the day throughout the two-day symposium. Above, left, Mitesh Patel fields questions from Jason Doctor, PhD, Director of Health Informatics at USC Schaeffer Center for Health Policy & Economics at the University of Southern California (USC); Jeffrey Linder, MD, Professor and Chief of the Division of Internal Medicine at Northwestern Medicine's Feinberg School of Medicine; and Daniella Meeker, PhD, Assistant Professor at the USC Keck School of Medicine and Adjunct Information Scientist at RAND. Above, right, Charlene Wong, MD, Assistant Professor of Pediatrics and member of the Clinical Research Institute at Duke University, chats with Amol Navathe, MD, PhD, Assistant Professor of Health Policy and Medicine at Penn's Perelman School, and LDI Senior Fellow. Raising his arms to emphasize a point (above, left) Northwestern University Memorial Health Care Chief Medical Information Executive Thomas Moran, MD, participates in one of the breakouts. Leading the session focused on the how-tos of nudging is Penn Medicine Nudge Unit Research Coordinator Tory Harrington. Above, right, Matt Van Der Tuyn, MA, Manager of Design and Strategy at the Penn Center for Health Care Innovation Acceleration Lab, leads another group through innovation tournament-like exercises in identifying, prioritizing, targeting, implementing, and evaluating the results of clinically-oriented nudges. In answer to their questions (above, left), attendees were urged to "think small" in achieving a string of nudge proof-of-concept successes as they work toward full-scale buy-in to the nudge concept from all their health system stakeholders. Above, right, in a breakout session entitled "What's Your Problem?" Penn Medicine Chief Innovation Officer Roy Rosin, MBA (above, right) used the case of the NS Savannah, the nuclear-powered freighter launched in 1959, to discuss problem identification and nudge targeting in health care clinical settings. In the mid-20th century, the U.S. shipping industry faced a perfect storm of escalating costs, outdated methods and ever-slower delivery times. Most industrial thinkers assumed the core problem was the speed of the maritime journey between ports, which triggered a frenzy of efforts to design faster freighters with smaller crews and more powerful engines, like the Savannah. But North Carolina trucking magnate Malcom McLean observed that the real problem was the long periods ships of any speed sat idle in port as their cargoes were manually loaded, unloaded and repacked to and from trucks. He designed an integrated "containerized" system that featured fleets of tractor trailer trucks with detachable cargo containers that could hoisted onto ships and unloaded directly onto truck carriages at the destination port. This ultimately revolutionized the worldwide shipping industry. "The relevance of this to our nudge symposium," said Rosin, "is that it demonstrates how important it is to correctly identify the health care problem you want to address with a nudge. Often, the real problem turns out to be surprisingly different from what general assumptions believe it to be." In another session, David Asch (above) gave a presentation entitled "Clinical Trials in Operational Settings: Avoiding Misdirections in Informed Consent." It addressed one of the trickier issues involved in conducting nudge research projects in clinical settings: how each project does or does not relate to Institutional Review Board (IRB) informed consent rules. In higher risk biomedical research -- brain biopsies, intrathecal chemotherapy, organ transplants, etc. -- the IRB requires that every subject involved in the study be fully informed and give their written consent to be included. But in low-risk behavioral economics research -- testing whether text messaging reminders to patients can improve adherence to statins, for instance -- getting the subjects' consent often alters the reality that's being measured and various IRBs across the country interpret the consent rule in different ways. "When we are studying basic physiologic processes, like the safety and efficacy of a drug," Asch said, "we expect that patients who consent will largely have the same experiences as those who don't consent. But when we are studying human motivation, as we do with nudges, it's quite possible that the consent process selects for those people who are the most motivated. In this case, those who consent to be studied can't represent those who don't, and the results of those studies requiring consent can lead to conclusions that aren't relevant to the general population." "Fortunately," Asch added, "most studies of this kind are of such minimal risk that consent need not be required." Asch and the Penn CHCI team has worked closely with its own IRB to streamline processes related to low-risk behavioral research. In fact, he and Penn CHCI Operations Director and LDI Senior Fellow Shivan Mehta, MD, MBA, recently joined with Tracy A. Ziolek, MS, CIP, Executive Director of the University of Pennsylvania IRB, to author a New England Journal of Medicine article about this issue.